Born: 1884, East Bergholt, Suffolk. 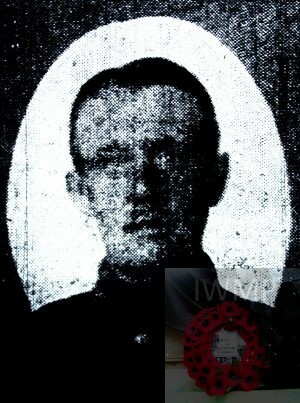 Died: 28th September 1917; Age: 34; Severely wounded by a bursting shell on the 19th September – Died of his Wounds at the Military Hospital,at Military Hospital, Dover, Kent. Employed: for five years as Barman at the Station Hotel, Ipswich. Regiment: The Rifle Brigade, 8th Battalion. 1891 Heath Road, East Bergholt, Suffolk. Frank was 7 years old and living with his widowed mother & siblings. Anna Knights (nee Neale), 41, a Coal Dealer, born Leiston, Suffolk. Ernest Alfred Knights, 17, a Brush Maker, born Framlingham, Suffolk. Bertram William Knights, 15, born Framlingham. Frederick Francis Knights, 11, born East Bergholt, Suffolk. Alice Annie Knights, 10, born East Bergholt. Lily Hetty Knights, 9, born East Bergholt. Anna Ella Knights, 6, born East Bergholt. 1901 Heath Road, East Bergholt, Suffolk. Frank was 17 years old, a Grocer’s Assistant. He was living with his mother & siblings. Ernest, 26, a Coal Merchant. Frederick, 21, a Coal Carter & Chimney Sweep. 1 boarder & 1 lodger. Frank’s father was Henry Knights, born 1843, Tunstall, Suffolk – died 1885, East Bergholt. Soldiers’ Effects to Anna Knights – mother. The funeral took place at Ipswich Cemetery recently of Rifleman Frank J. Knights. The deceased previous to joining the Army was employed for five years as barman at the Station Hotel, Ipswich. He joined the Suffolk Regiment in March 1916, and proceeded to France in the following September, and was invalided home with trench fever, but returned to France in April, 1917. On September 19th he was severely wounded by a bursting shell, and succumbed to his injuries on September 28th in the Military Hospital, Dover. Full military honours were given at the funeral. The bearers, firing party, and buglers were sent by the Suffolk Regiment. The coffin, covered with the Union Jack, was borne on a gun-carriage drawn by six black horses. The interment took place in the Field of Honour, the service being conducted by the Rev. C.R.Phillips (curate of All Saints). The mourners included: Mr. A. Knights and Pte. F. Knights (brothers), Miss A. Knights and Mrs. Young (sisters), Mrs. F. Knights and Miss Marjorie Young. The deceased soldier’s mother and youngest sister were unable to attend through ill-health. Messrs. Hastings and Son carried out the funeral arrangements.